She went into Zechariah's house and greeted Elizabeth. Now as soon as Elizabeth heard Mary's greeting, the child leapt in her womb and Elizabeth was filled with the Holy Spirit. She gave a loud cry and said, "Of all women you are the most blessed, and blessed is the fruit of your womb. Why should I be honoured with a visit from the mother of my Lord? For the moment your greeting reached my ears, the child in my womb leapt for joy. Yes, blessed is she who believed that the promise made her by the Lord would be fulfilled." Meditation: When Mary went to visit Elizabeth, her coming caused marvels of grace. Today again Mary comes to visit us. Like Elizabeth we say "How happy am I that the Mother of my Lord should come to me." Jesus, we thank you for sharing your Divine Life with us through Mary. We thank you that you chose to come to us through Mary. May we receive you and immediately desire to give you to others, like Mary. Eternal Father, by the merits of the visitation, teach us to follow the inspiration of the Holy Spirit, so as to know how to bring Christ to our brothers and to be able to glorify you in song and holiness of life. Mary my Mother pray for me so that imitating your love I will take Jesus to my neighbour. The Visitation - As we contemplate this wonderful mystery, let us pray for the protection of all vulnerable human life. May the eyes of the world be opened to the beauty and dignity of each human person, whatever their age or capacities. And we pray for an end to laboratory experimentation on the earliest moments of human life and to an end to abortion. 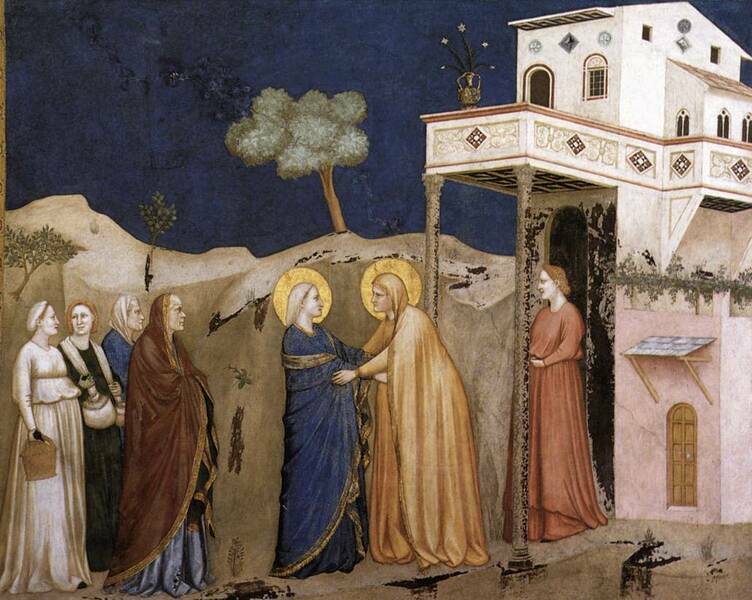 Click here for more on this mystery & feast of the Visitation by Blessed John Paul II, Papa Benedict XVI & Pope Francis. "Jesus has just been conceived in the womb of Mary; it's probably only days, weeks at the very most, time when most women would not even know that they are pregnant, Jesus is a living human being but in the most hidden place any human being can be. Yet we remember that Jesus is hidden within us, within every person, in what St John of the Cross calls our deepest centre. That's where we first meet Him in the Gospels and that's where He is with us always. John the Baptist is also a child in the womb. We're told by his mother Elizabeth that he leapt with joy. John, in the womb, could receive Jesus, could receive the grace of Jesus's presence. A reminder to us that not only is a child in the womb a living human being, but a child in the womb has the capacity to receive God's grace, has a spiritual life, is in relationship with God." "I actually love Our Lady and what really makes me happy about her is what Elizabeth said to her when she visited Elizabeth, that blessed is she who believes the word the Lord told her would come to pass." My soul magnifies the God of love; - Gabriel was sent to Galilee - Joyful is my soul in God, above. - where he spoke unto the maid Marie: For the Lord has come, mankind to bless, - "Highly favoured one, the Lord's with you! - looking on his handmaid's lowliness. - Marie be not afraid." - Blessed they shall call me from this day. - "You have won God's favour, blessed one. - Mighty is the Lord to whom we pray. - You will bear a child, God's own dear Son. - Holy is his name, for evermore; - Call him Jesus. He'll be Israel's king. - merciful the God, whom we adore. - Salvation He will bring. - Might is the arm of Israel's Lord. - Mary questioned: "How can this thing be?" - Scattering the vain, with one accord; - "Truly, no man ever has known me." - putting down the proud ones from their seats; - "God's own Spirit will come down on you, - lifting up the lowly and the meek. - Salvation he will bring." - He has filled the hungry, with all good things; - "I am Yahweh's handmaid," said Marie. - Sent away the rich and noble kings. - "As you say, be it done unto me." - He has blest his servant, Israel, - By the Spirit, Mary did conceive - merciful the Lord who makes all well. - God's Word was then made flesh.